Forever a trailblazer, Virgil Abloh revolutionized sneaker collaborations with his “The Ten” collection in 2017. 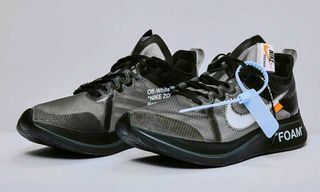 In an unprecedented move, “The Ten” included Nike sneakers and silhouettes from Nike-owned brands Converse and Jordan. It was the first time a single designer had launched such a comprehensive sneaker collaboration with a brand such as Nike. Fast forward to 2018 and more sneakers have joined the ranks, including the Nike Zoom Fly Mercurial Flyknit. 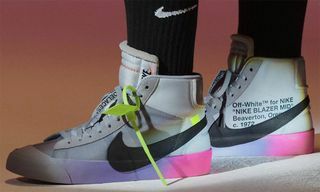 Up to eight more kicks are rumored to drop sometime before the end of the year, bringing the grand total of Virgil Abloh x Nike sneakers to a potential 26. While many sneakerheads unboxed their pairs straight away, opting to rock them, there were plenty of people looking to flip the sneakers for a profit. Value of the original 10 sneakers’ skyrocketed, while the resale prices of the 2018 collaborations vary. 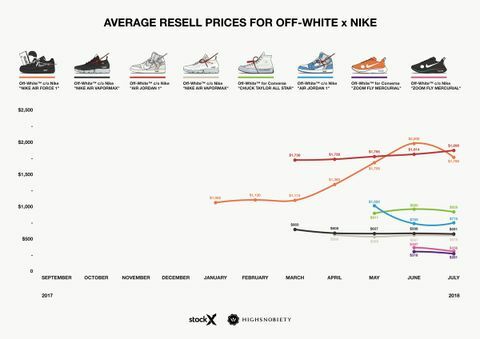 Below we analyze the resale market for Virgil Abloh’s Nike collaborations, with data sorted by market share and prices over time. The data is an aggregate of deadstock sneaker sales from StockX. Check out the results below, with data courtesy of our friends at StockX and illustrations by Dan Freebairn. 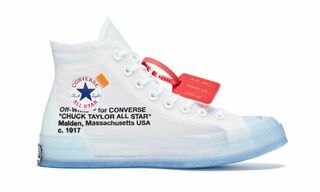 Nine of “The Ten” were released in 2017, with the Converse Chuck Taylor the only original silhouette to see a 2018 release. 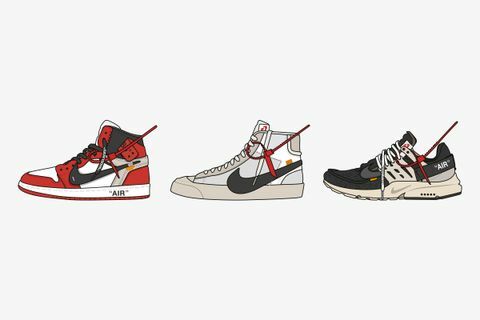 Of those nine, five dropped in September, including the Air Max 90, Air VaporMax, Air Jordan I “Chicago,” Blazer Mid, and Air Presto. The above chart tracks the average resell price of each of those sneakers since their first release through to July this year. It’s clear that certain models such as the Air Jordan I and the Air Presto perform better than others on the resell market. Of the five sneakers, three cracked a $1,000 average price. These are the “Chicago” Air Jordan I, the Air Presto, and the Air VaporMax. 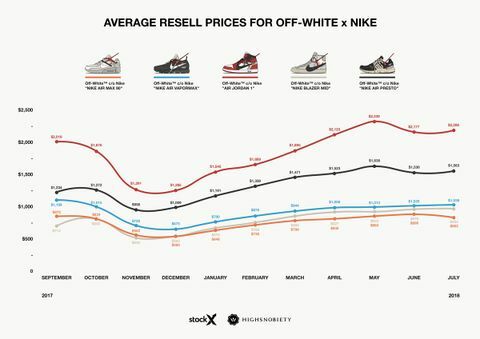 You can see a pattern in the data with each of the five sneakers, with resell prices starting high, dipping after a couple of months, before rising even higher. The perfect example of this pattern is the “Chicago” Air Jordan I, which resold for an average $2,019 upon release in September last year. 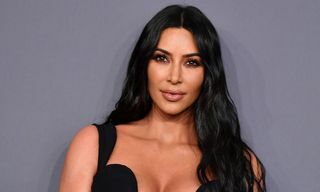 Its price dipped to a low of $1,285 three months later, but latest figures show MJ has rediscovered his hang-time, with the sneaker leaping over its original average resell price to hit a peak of $2,339 in May before settling at $2,206 this month. Of the five September 2017 sneakers, the “Chicago” Air Jordan I sells for the highest price, clocking in at an overall average resell price of $1,591. Four more sneakers from the original “The Ten” collection followed in November and were joined by the all-white, ComplexCon “AF100” collection exclusive Air Force 1. 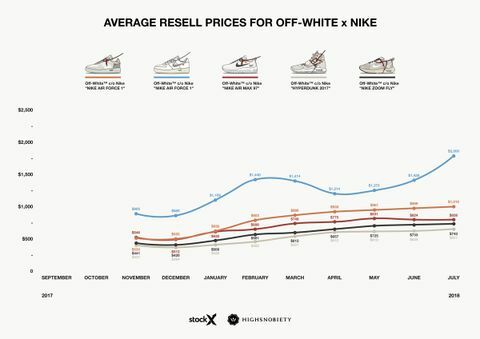 The chart above tracks the average resell prices over time. Only two sneakers crack the $1,000 mark, both Air Force 1s. The ComplexCon Air Force 1 is by far the most valuable, hitting an average resell price of $2,000 in July. We see a clear pattern in which the sneakers’ average resell prices dip after the first month before picking up again and soaring after several months. Of the two Air Force 1s, the one from “The Ten” has seen the most consistent growth, whereas its silver-Swooshed “AF100” counterpart has fluctuated slightly from month to month, falling in value from February to April before shooting back up again. 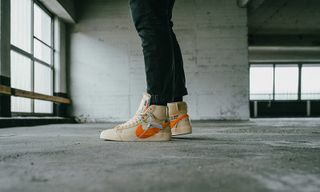 Compared with the September releases, the November “The Ten” sneakers, although still expensive, are generally lagging behind in terms of average resell prices. This could speak to the popularity of the earlier models or it could mean that the later kicks were more widely available, keeping prices lower. Either way, if you managed to scoop any pair at retail price, you’re sitting on a very healthy appreciation in value. Eight sneakers followed in 2018. With the release dates staggered, it’s harder to track the shoes’ performance in comparison with one another. Regardless, one can safely say that every release has been selling for well above retail price. The two most valuable sneakers on this chart are the white Air Jordan I and the MoMA-exclusive black-and-silver-Swooshed Air Force 1. The latter was released in January and appreciated from an average resell value of $1,080 at release to $1,780 in July, peaking at $2,000 in June and becoming the only 2018 sneaker to join last year’s “Chicago” Air Jordan I and “AF100” Air Force 1 in the $2,000 club. The former dropped in March and its price has steadily increased from an original average of $1,736 to $1,890 in July. Interestingly, the 2018 releases don’t seem to follow the same pattern as the earlier kicks, wherein there is a high initial resale price followed by a short decline, before shooting up past the original resale price. Although the data is still limited, the “UNC” Air Jordan I is an example of this. At release in May, resale prices were $1,020. But two months later, the sneaker’s value has fallen by nearly 25 percent to $775. It’s still too early to judge how the two Zoom Fly Mercurial Flyknit colorways will do, having only been out since June. But for now they remain by far the least expensive of all the OFF-WHITE x Nike sneakers on the resale market. 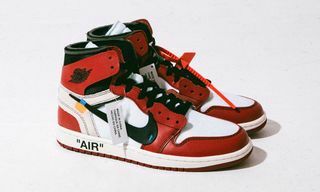 Overall, Air Jordans sell for the highest average price, clocking in at an overall average resale price of $849 for the “UNC” version, $1,591 for the “Chicago” iteration, and $1,765 for the all-white colorway. 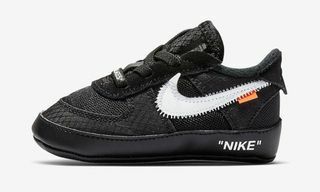 In related news, be sure to check out the beginners guide to every OFF-WHITE x Nike release.